As seasons change, so do our activities. We take up new sports or exercise routines; we take to the outdoors to start gardening again or to tackle a home improvement project. Strains from unaccustomed tasks such as these are likely to cause sore muscles. Fortunately, there’s Arnica, a convenient and reliable medicine for muscle pain, stiffness, and bruises. The Arnica plant has been used for centuries as a natural pain reliever. Arnica montana is the Latin name for a perennial that grows 1 to 2 feet tall with bright, yellow daisy-like flowers that appear in July and August. It is found on the moist, grassy upland meadows in the hills and mountains of northern and central Europe and Siberia. It is also found sparsely in the northwestern United States. 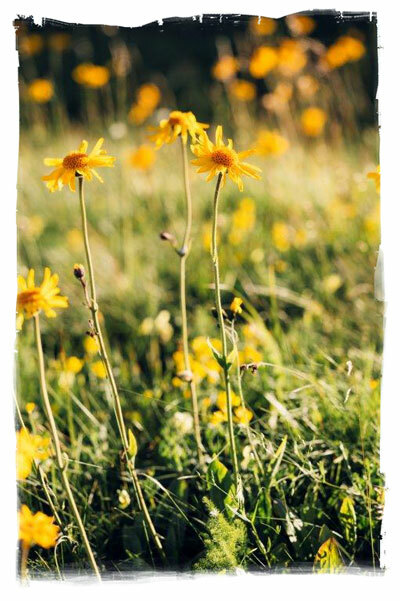 More common names for Arnica are mountain daisy, leopard’s bane, and mountain tobacco. Arnica can be used as an ointment, gel, or cream on unbroken skin or taken internally when it is diluted homeopathically. St. Hildegard, a German nun known for her keen observation of nature and physiology, among other things, wrote about the healing properties of the Arnica montana plant in the 12th century. Since at least the 16th century, mountain people in that area have used it to relieve muscle aches and bruises. Today, Arnica has grown to be one of the most popular homeopathic medicines throughout the world. It is trusted by professional athletes to soothe sore muscles, by prominent cosmetic surgeons to relieve post-procedure pain, and by savvy parents to treat playground bumps and bruises. Arnica can also be used to relieve stiffness from flying or long-distance driving. And anyone who bruises easily will appreciate Arnica’s ability to reduce bruise discoloration. To help recover from minor injuries, overexertion, or surgery, Arnica is a must for every medicine cabinet. Whether you are an active baby boomer, a weekend warrior, or a professional athlete, it’s the perfect answer to all of life’s little injuries.